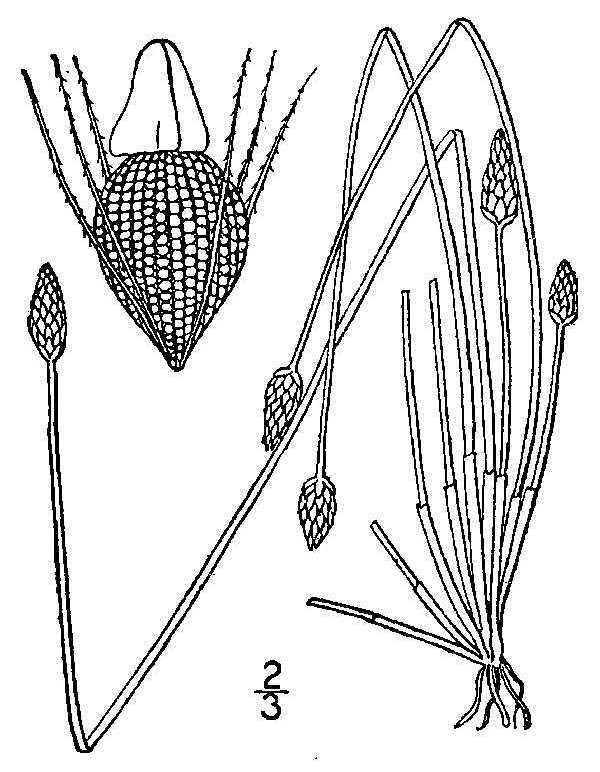 Eleocharis tuberculosa.USDA-NRCS PLANTS Database.Britton, N.L., and A. Brown. 1913. An illustrated flora of the northern United States, Canada and the British Possessions. Eleocharis tuberculosa is an annual spikerush, tufted, stems flattened, 20-80 cm tall. Flower spike egg-shaped, 0.5-1.5 cm long, tip pointed, scales rounded above, straw-color to dull brown, clasping achene. Fruit a dry achene 3-sided, about 0.1 cm, widest above middle, with many rows of tiny warts, tubercle narrow-based, then widened, about as large as achene, sitting on top like an outsized hat, June-Sept. Frequency in NYC: Rare (NYS S2, T). Habitat: Wet, often sandy soil, swamps, shores.